Lua error in Module:Location_map at line 488: Unable to find the specified location map definition: "Module:Location map/data/USA Minnesota" does not exist. Saint Paul is the capital city of the U.S. state of Minnesota. It is across the Mississippi River from Minneapolis. When people talk about both cities, they call them the Twin Cities. ↑ "The City of Saint Paul – Official website". The City of Saint Paul. 2008. Retrieved July 30, 2008. 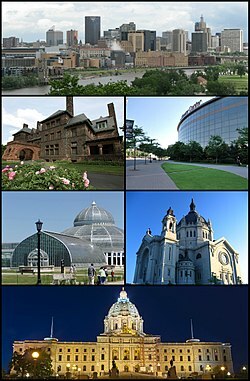 Wikimedia Commons has media related to Saint Paul, Minnesota. This page was last changed on 7 June 2018, at 14:08.